The VM-10xl is a broadcast quality 1:10 distribution amplifier for composite or SDI video signals with unbalanced stereo or balanced mono audio. It provides controls to compensate for signal losses inherent in long cable runs. High Bandwidth - 360MHz (−3dB). Broadcast AV duplication studios, delivering undiminished quality duplicates. Video audio showrooms for delivering an identical picture and sound to several monitors. Video component distribution using several VM-10xl units. INPUTS: 1 composite video with loop, 1Vpp/75Ω with termination switch on BNC connectors; 2 balanced stereo/mono audio with loop, 1Vpp/50kΩ on RCA connectors. 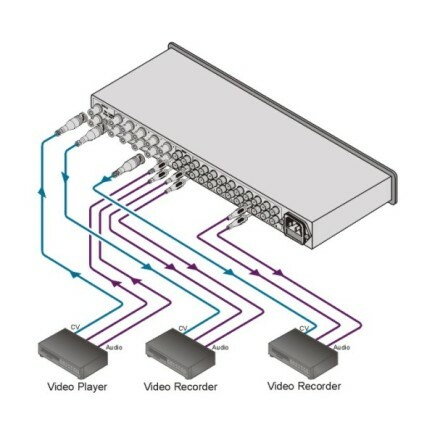 OUTPUTS: 10 composite video, 1Vpp/75Ω on BNC connectors; 10 balanced stereo/mono audio, 1Vpp/50Ω on RCA connectors. BANDWIDTH (-3DB): Video: 360MHz, Audio: 100kHz. S/N RATIO: Video: 77dB, Audio: 87dB. CONTROLS: Video level: (−1.2dB to +6dB), EQ. (0dB to +8.1dB); audio level: (0dB to +6dB); balanced/stereo selector switch and audio control enable switch. COUPLING: Video: DC/AC; Audio: AC (input), DC (output). AUDIO THD + NOISE: 0.023%. POWER CONSUMPTION: 230V AC, 50/60Hz, (115V USA), 4.7VA. PRODUCT WEIGHT: 1.7kg (3.7lbs) approx. SHIPPING WEIGHT: 2.4kg (5.3lbs) approx.